Since completing an apprenticeship in 1978, Paul progressed through the industry before joining Mercury in 1987 as commercial manager for the company’s UK operations. 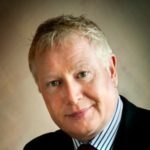 Returning to Ireland in 1989, Paul has held key positions in commercial and more recently marketing, sales and business development roles within the company. His ability to develop new and existing client relationships significantly contributes to ensuring that targets and growth strategies within the company are being developed and maintained. He is a high energy, results-oriented and commercially astute individual with a proven track record creating real opportunities internationally.